Saturday was raining cats and dogs so I decided not to go to the Carnival parade. Today we went for a walk downtown and still could see costumes here and there or take shots of beautiful masks like these displayed in a shop in the Gothic Quarter or Barri Gotic. I took some more pictures in the area, not related to today's topic, which I will show you soon. Superb picture Carlos, I just didn't have the time to pass comment when I looked through the portal yesterday. You are right Jessica, there are some good videos about Barcelona in this site. The link in particular talks about the Carnival in other countries but I think our visitors should perform a search, as there are at least 10 videos about my city. Thanks! Sorry you didn't come to the main parade. My wife's from New Orleans, and while she wasn't with me (I came for 3GSM last week), I knew she wanted me to see the parade. So, even though I was quite damp from the downpour at 6pm, I took L3 up to the Lesseps stop to see the parade. As part of my eat-all-day plan for dealing with my large appetite and the need for adjusting to your local dining schedule, I had an apple on las Ramblas prior to getting on the metro, I had a quick coffee at Dunkin Donuts (yes, typical American tourist in the metro :-) and then I stopped for a beer with a small ham and cheese sandwich right outside the metro exit. After my beer, I walked down the street (Gran de Gracia) through all the groups milling around getting ready for the parade. Once I got to the start of the parade, I stopped and waited, just in front of Restaurant Fontana. There was no rain for the entire time of the parade. I really enjoyed all the groups and was especially impressed with the enthusiasm of all the Central American & South American cultural orgainzations as well as the lovely costumes of the group dressed as the Muses of the Palau. By 10pm, my need for another round of eating got the better of me and so I turned and went into Restaurant Fontana for the menu del dia (I can't tell you what I had as the staff pointed to a variety of their micro-plates as being part of the menu del dia & I just ate what they brought me (yes, it was quite good)). Now I'm back home, but I really enjoyed your beautiful city. 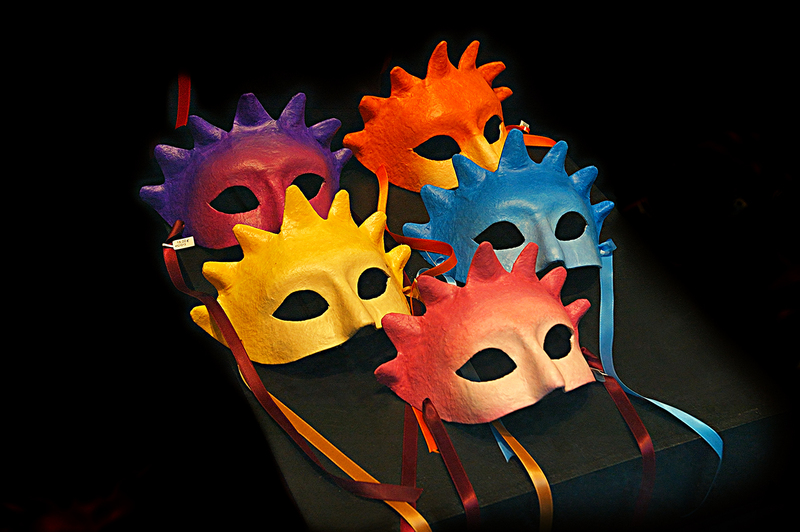 These masks aare really quite striking in their simplicity! !